An On-Line Electric Vehicle (OLEV) that can charge during travel will be put into service for the first time in the world on normal roads. 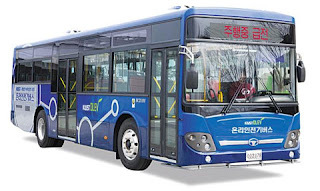 From July of this year 2 OLEV buses will undergo trial operations in the city of Gumi. The trial route spans 24km from Gumi station and the region of In-Dong and the establishment of the route is expected to be of a 4.8billion Won (AUD$ 4.3M) scale. The start of the infrastructure construction will start on February and operation will start in July. KAIST had held sessions in October of last year to local governments and had a follow up OLEV suitability evaluation to those local governments expressing interest. The city of Gumi was elected due to its good electrical infrastructure and an administrative willingness to match. 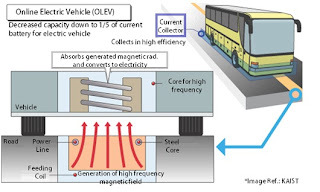 The OLEV developed by KAIST is an environmentally friendly vehicle that allows the transfer of electrical power using magnetic fields imbedded in the roads. Engineers say the transmitting technology supplies 180 kW of stable, constant power at 60 kHz to passing vehicles that are equipped with receivers. The initial OLEV models above received 100 kW of power at 20 kHz through an almost eight-inch air gap. They have recorded 85 percent transmission efficiency through testing so far. The wireless electricity that powers the vehicle’s motors and systems is also used to charge an on-board battery that supplies energy to the vehicle when it is away from the power line. Ordinary electric vehicles require frequent visits to replenish their power which gives the OLEV a comparative advantage as it can charge while on the road. The ability to charge whilst on the road means that the OLEV requires a smaller battery than the ordinary electrical vehicle resulting in lower prices and weight. 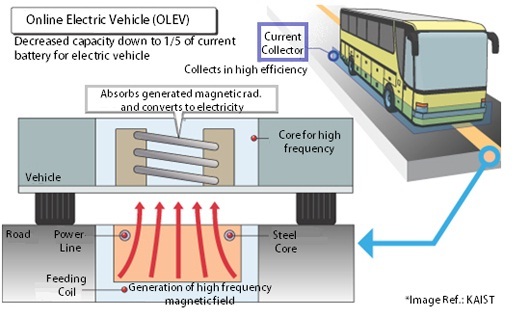 The OLEV development commenced at KAIST in 2009 and in 2010 most of the core technologies required to realize the OLEV was developed and verified. Finally in 2012 steps were taken that will allow the commercialization of the OLEV. The KAIST OLEV was named top 50 inventions in 2010 by Time Magazine.